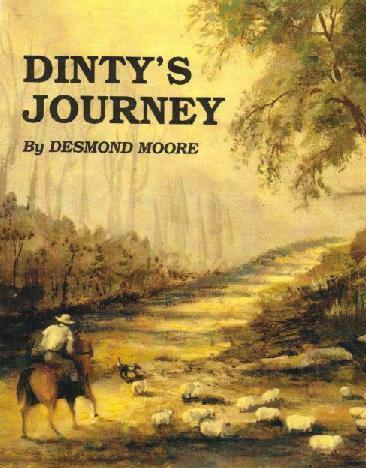 An Autobiography---Dinty’s journey traces the life of Des Moore from his birth in Harvey to his early days in Nannup through to his later years in Denmark, it includes interesting sections of his lifetime including over a fifty year involvement with his pigeons in racing, showing, judging and writing articles for the pigeon fancy under the name of **Moore From Western Australia**, it is the history of a young couple growing up together from early Childhood to teens then Marriage having a family and then finally settling in the Town Of Denmark on the South Coast of Western Australia. Bill Cowell Wincanton, Somerset, England. 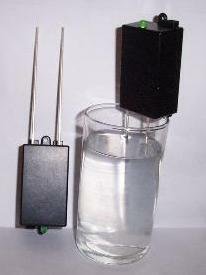 Make your own Colliodal silver water for 4 cents per litre. Normally costs up to AU$30.00 per litre. Generator comes with a 12 months warranty on working parts. Our generator is completely portable take it on your holiday to sterilise the water at your destination, It is battery operated that can supply 4-5 ppm of Colliodal Water in under three minutes a little longer in pure distilled water. Price includes both rods and one spare rod which are 99.9% pure silver each rod should last 12 months with normal use (Battery not included with generator) a small square 9v battery bought at the supermarket is the power source. For any external use you such as cuts or burns you may choose to make the water stronger as it kills any bacteria in the wound. For the best results and the purest colloid use it is best to use distilled water. Most antibiotics have an optimal effectiveness against only a few different disease germs; even broad-spectrum antibiotics may kill only 10-20 different types of bacteria. Also, most antibiotics that kill bacteria will not kill fungus/yeasts, protozoal parasites or viruses, antifungal antibiotics will not kill bacteria, viruses, parasites, etc. And virtually most known viruses are immune to virtually all known antibiotics." Silver is unique among antimicrobial agents in its broad spectrum of action. It has been claimed to kill some 650 different disease organisms. Unlike antibiotics, it is an 'equal opportunity destroyer' - it doesn't discriminate, but effectively kills germs of all major types: gram-positive and gram-negative bacteria, spore-forming bacteria, fungus/yeasts, viruses and protozoal parasites. Sulfadiazine is used almost universally in hospitals to prevent serious burn infections, but it also kills dozens of different bacteria, It also kills various yeasts, including several Aspergillus varieties, and 50 different clinical isolates of Cadina, it was also used to cure stomach ulcers when it was discovered they were caused by a bacterium. It was actually rediscovered that colloidal silver kills bacteria something that has been used for that purpose for centuries well before antibiotics were discovered, clinical uses for colloidal silver as an antibiotic were discarded when antibiotics became the popular fix all. The generator will harvest between 4-5ppm within 3 minutes using a 200ml glass (dependent on the water quality and temperature). It is the smallest and easiest generator to use on the world market. Colloidal Silver mingles with your blood and enters the cell to seek out and destroy harmful organisms. Due to the high absorption of silver in the small intestines, the friendly bacteria in the large intestine are not affected. Every one of the man made antibiotics will kill only five or six types of germs. On top of that, more and more bacteria are becoming resistant to these antibiotics, commonly known as ‘Super bugs’. Colloidal Silver will kill most of those ‘Super bugs’. It acts like a second immune system. Colloidal Silver as a preventative is unsurpassed. Sufficient Colloidal Silver, taken daily, precludes infection and disease. It lessens the load on the body’s natural immune system. Make sure you have a reliable timer or oven alarm set for 3 minutes before you start making a new batch. Drink it or use it immediately as silver is photo sensitive, always use glass or plastic, keep away from metal as this makes the silver loose its strength, any that you want to keep store in a dark cupboard in a glass container. You may also use the solution as ear, eye or nose drops as long as it is fresh. Use it as a mouthwash and gargle every night. Drink it when you have the very first symptom of an on coming flu or cold. A ticklish throat, a raspy cough, a runny nose. You may use it several times a day, depending upon the severity of your affliction. A reason for antibiotics being so popular in the medical arena is the fact that they can be patented. Therefore it is in the pharmaceutical companies’ financial best interests to keep doctors educated in their medicines whilst other products go unheralded. Silver is not patentable and therefore there are no enormous profits available to pharmaceutical companies and thus not worthy of massive promotion. Simple low cost products are run over by high priced products because they are more shareholder friendly! This is occurring at a time disease bacteria are developing immunity to antibiotics this immunity is developing the world over even in isolated areas. Privately the medical expresses alarm. The above is for information only it is not an attempt to practice medicine it is only supplying information for any person that may be looking for an alternative to manufactured drugs. Don't pay $25:00 per litre for your Colliodal silver make you own, the same amount will only cost you a few cents to make. 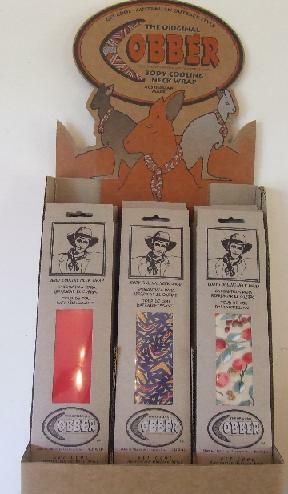 The cooling neck wrap, it is an original **Cobber**, made in Australia for Australia's extreme heat conditions it can be used in any country world wide to reduce body temperature, the scarf can lower body temperature for 2-3 days without refrigeration. It is reusable and will rapidly lower body temperature, each one has a different design printed on it. Cobber keeps you cool when working, playing sport or just relaxing, simply place your cobber in cold water then wear it around your neck or forehead for a cool refreshing surprise. There are a quantity of the Cobber body cooling neck wraps available in different colours, The scarves in the photo are only to be used as a sample as designs are constantly changing they range from just plain material to many eye catching coloured pattens. There is a reduced postage rate for more than one item bought.